Pianist Richard Valitutto is distinguished for his tenacity in bringing dynamic life to scores and his distinctive programming. 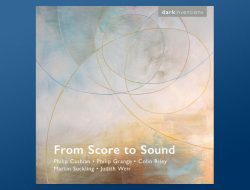 This programme with Saxophonist Dave Wilson includes Philip Cashian’s Nocturne alongside works by Rebecca Saunders, John Cage, Nicholas Deyoe and a new work of their own. This will be the U.S. Premiere of Leonora Pictures takes inspiration from the fantastical characters and landscapes of Lancashire-born surrealist artist Leonora Carrington, commissioned by Psappha.